Sorry for the silence over here last week! I have a fun project to share today that I recently completed for Ehow. Our guest bedroom has been a work in progress since we moved in. We originally put our bed from our old bedroom in there, but it just didn't look right. The room is fairly small and the large, black bed felt like it was taking over the room. I knew I needed to change it up, so I created this padded headboard for Ehow and it's amazing what a difference it has already made in there. Here's a little peek. I'm still totally undecided on the direction I want to go in there, but at least this is a step in the right direction! 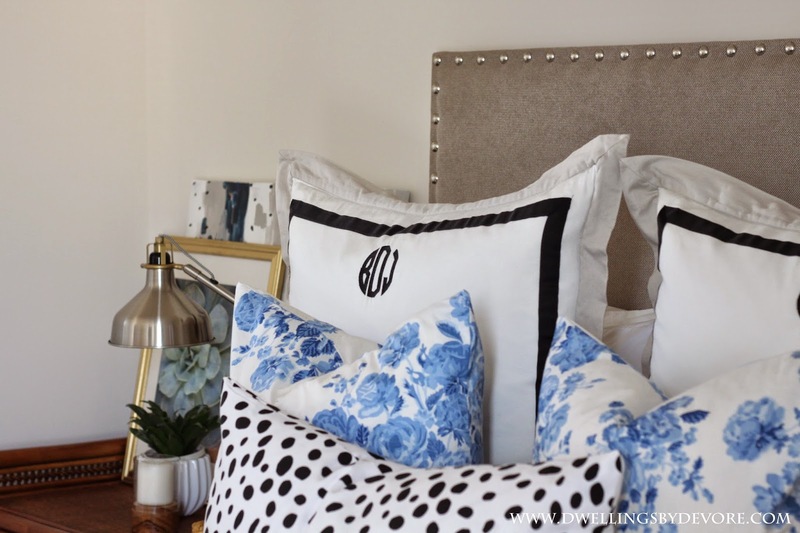 As much as I wanted to go with a bold color or fun pattern, I knew a neutral fabric would give me the freedom to go in lots of different directions and easily change things up down the road. Hopefully I'll have more progress to share soon! You can find the full tutorial here. Oooh, what a pretty guest room Bethany! Love it with your pillow combo!